I have to digress slightly here! I have been on 10 days leave and spent some of the time exploring the beautiful Chobe game reserve as well as fishing. The fishing has not been good. I have literally caught two in the entire 10 days. 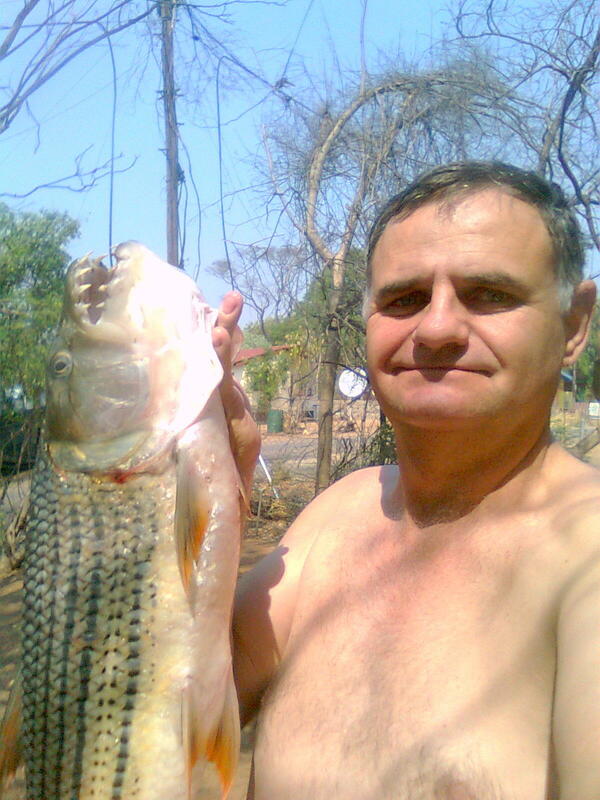 HOWEVER....The one I caught was this..
Nearly eight kilograms of Tiger Fish. Well because I fish strictly for food I am going to have an interesting time finding ways of preparing and cooking this. I will give at least half of it away to some Zimbabwean friends who love fish. I was spinning using a spoon I designed and made myself. 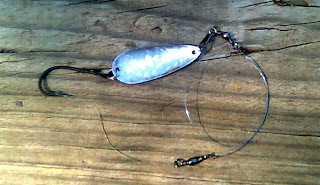 Here it is..
After a fairly classic smashing strike the fish ran off about 120 meters of line. I was using 8kg braided line. A very dodgy line I have had some breakages with so I was playing the fish very carefully. I had a few airborne leaps, but tried to avoid them by giving a bit of slack when I saw the line angling towards the surface. After 35 minutes the fish was close by. The water shallowed and there were a lot of rocks I had to steer the fish through. The fish was splashing around a lot and it must have attracted some crocodiles.All of a sudden there was a crashing of spray and a huge croc lunged at the fish and grabbed it just behind the gills. I screamed and waved my hands and fortunately the croc was as surprised as I was and dropped the fish and plunged back. At this point I noticed 3 other crocs, all around 10 or 12 foot on the surface surrounding the action. Here is one my daughter photographed last week the same size. The big one I had just driven off didn't go far but circled and began coming in again. Well all this was happening in seconds! Adrenaline was rushing, my heart was pumping! Holding the rod with one hand I managed to pick up rocks and hurl them at the crocs until they submerged. Not sure if that was a good idea because I didn't know where they were now. To cut a long story short I managed to tussle the fish over the rocks to a fairly rocky place in the water where I hoped I was protected from the crocs. I managed to get hold of the steel trace and towed the fish onto the bank where I dispatched it. Fortunately the bite from the croc did not damage much meat. I had to carry that fish nearly a kilometer to reach the car on shaking legs. Glad to see the picture of the Tigerfish,it looks really big.Very fortunate that you managed to land it, despite the size and hungry crocs. A nice adventure even though the fishing may have been light. I envy you Archi, exept for the Crock part. Look forward to you recipe as always.